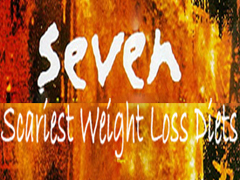 The 7 Scariest Weight Loss Diets « Burn The Fat Blog – Tom Venuto. It’s called the KE diet, and it promises that you’ll lose 20 pounds in 10 days. Sold to brides-to-be as a quick way to lose the last 10, 15 or 20 pounds before the wedding, it involves inserting a feeding tube into the nose that runs to the stomach. The dieter (“victim?”) is fed a slow, steady drip of protein and fat, adding up to 800 calories per day, and zero carbs. The pitch for this crazy program says that it’s safe and doctor supervised, although the patient is not hospitalized during the diet – they carry the food solution around with them. According to ABC news, which originally broke the story about this nightmare on diet street, doctors charge $1500 for the 10 day plan. Side effects (in addition to shrinkage of your wallet) include fatigue, bad breath, constipation and strangers staring at the hose in your nose. Even though this one is so creepy it could be an ideal way for a horror movie villain to slowly torture his victims to death, the tapeworm diet really has been used for weight loss (urban legend says Maria Callas did it). It came to public attention when the Tyra Banks show did a “gross-out” spot about the diet. Audience members squirmed as the doctor pulled a 15 foot tapeworm out of a jar live on camera. Purchasing these parasites for weight loss is illegal in the USA and not approved by the FDA, but you can allegedly order (illegally) from countries like Venezuela or go to Mexico and pay a couple grand for beef tapeworm worm larvae. After you consume the “worm egg pill” it hatches in your digestive tract, latches onto your intestinal wall and feeds off the energy and nutrients from the food you eat, growing larger and larger. After a few months, you return to the clinic for anti-parasitic medication that kills the worm. The dead creepy crawler then passes out your body (try to visualize that if you want to really gross yourself out). Aside from that fact that it’s vile and disgusting, what’s wrong with this idea? On the mild end, the tapeworm can lead to pain, nausea and a bloated stomach. It can also compete with you for vital nutrients, leading to deficiencies or anemia. At the severe end, the hermaphroditic tapeworm can lay eggs inside you. Infestation of certain species can travel beyond the digestive tract into the circulation and can also lead to cysts in the liver, lungs, eyes and spinal cord or brain. Using tapeworms for weight loss can be fatal. No source for the story was cited, but according to Spike TV’s “1,000 Ways To Die” a woman lost 60 pounds after ingesting a tapeworm for weight loss. The worm grew to 20 feet then laid eggs, which burrowed through her intestinal wall and into her circulation where the infestation of worms promptly killed her. This is really twisted. I am not kidding – this makes me think of one of those horror movies with the crazy doctors that perform sinister medical experiments. According to an ABC news story, a doctor in Venezuela has done 800 of these procedures which involves sewing a patch of plastic mesh onto their tongues. The patch makes it difficult to eat or swallow – it even causes pain if you try to eat with the patch attached. A cosmetic surgeon in California brought the procedure to the United States after seeing it in Latin America. The doctor charges $2000 for the procedure and promises 18 to 20 pounds of weight loss in 30 days. How do you get any nutrition or caloric sustenance? The procedure comes with an 800-calorie per day liquid diet of shakes and drinks until the patch comes off. Yes, I’ve written about this one before because it’s my favorite diet to hate, but no list of horrifying diets would be complete without it. HCG is not a new one – it’s been around since the 1950′s, but there was a resurgence of the HCG diet over the last several years and it’s still out there, promoted in books, on websites and even in doctors clinics. Those diabolical docs make big money selling this stuff. The HCG protocol is a 500 calorie per day diet combined with injections of a drug called Human Chorionic Gonadatropin or HCG for short. What’s creepy about this one? Aside from the required needles, HCG is actually a fertility drug which is extracted from pregnant women’s urine. It’s one thing when a diet, drug or supplement has no research saying either way whether it works or not. But HCG has been shown in nearly a dozen controlled clinical trials to be no more effective than placebo, with some of these trials going back to the 1970′s. Beware if you say something bad about HCG online. HCG true believers come out of the woodwork to defend it like crazed Orcs, grunting about how it worked for them. Well of course “it works.” The HCG diet comes with a 500 calorie per day food plan. Do the math. The weight loss comes from the starvation level calorie deficit, not the HCG. Which means… 500 calories a day without the HCG will produce the same results, all else being equal. I was always shocked at how many bodybuilders smoke. On a regular basis, I would walk outside after a bodybuilding contest and to my astonishment see entire groups of competitors puffing away. Whether they continued to smoke because they felt it was easier to get lean, I don’t know, but we’ve all heard about how people struggle with weight gain when they kick the smoking habit. Well, one day it dawned on some genius that taking up smoking might help with weight loss and the cigarette diet was born. Years ago, they called this the “model’s diet” which consisted mostly of cigarettes and water. Lung cancer for tight abs or a svelte runway model body. Sounds like a fair trade. What you might not know is that today we have fitness models and bodybuilders adding nicotine on top of their drug stacks and contest prep gurus recommending nicotine supplements to their clients nonchalantly as if it were vitamin C. “Studies say nicotine may help with fat loss, it’s a stimulant and doesn’t cause cancer – it’s the cigarette smoke delivery system that causes cancer,” the gurus proclaim. Great, just what we all need – more stimulants, potentially addictive. But moreover, I think the drug culture in bodybuilding and the never-ending desire and search for “something to take” is insane. Also known as the Prolinn diet, this plan was created by Roger Linn in the 1970’s. Like so many other diets, Linn concocted a special drink. Some stories about the Last Chance diet say it was a “400 calorie liquid protein beverage” and while the 400 calories per day qualifies as a dangerous starvation diet by itself, the term “liquid protein” doesn’t raise too many alarms for most people these days. But upon deeper investigation into the protein source, the gross part emerges. Sound so crazy that no one in their right mind would try it? Well, it’s estimated that between two and four million people did it. It is most infamously known today because 58 people died from heart attacks while on it. Whether it was the low nutritional quality of the drink or people starving themselves to death, either way, it killed them. The master cleanse diet may not seem horrible or gross like some of the others on this list, after all, it’s just drinking lemon water for 10 days, right? (lemon water with maple syrup and cayenne pepper to be exact). What’s scary about it is the number of people who have done it – surely in the millions – and how many followed it like sheep just because it became a popular celebrity-endorsed fad (brainwashed hordes qualifies as “scary” in my book). Although this diet has been around since the 1940’s, it hit the big time in 1976 with Stanley Burrough’s book, “The Master Cleanser.” After a few Hollywood celebs tried it, it blew up again and is still hugely popular on the internet. As with HCG, followers are like zombie hordes, screaming for brains if anyone dares to speak out against their sacred diet. Why the rabid cult following? My guess is there’s a health halo effect when “cleanse” and “detox” are mentioned in conjunction with a weight loss diet. In fact, some people say they do it to cleanse not to lose weight. Nevermind that cleansing and detoxing are scams (meaningless and conveniently vague terms as well), 600 calories per day is just another starvation diet. Some dieters are proud to have gone through this torture for up to 40 days. Does it work? Sure, if you like looking like a skeleton and being as weak as a kitten. This one is a real lemon. Try cleansing your refrigerator and cupboards of junk food instead. Fad diets aren’t going away. Old ones will be recycled and new ones will be invented, and people who allow their emotions or social influence rather than critical thinking to control their behavior will continue to fall for them. Humans are emotional and impatient creatures, so the temptation to try a fad diet, or even something drastic, may always be there. Fortunately a few simple shifts in your outlook could keep you out of harm’s way and on the right path. First, make health your highest value and that alone will go a long way toward keeping you away from the next fad weight loss diet. Second, forget about weight loss and focus on burning fat and building muscle. It’s not about how much you weigh, it’s about what that weight consists of. Once you realize that, you’ll automatically start avoiding crazy diet plans that cannibalize your lean body mass. Third, focus on getting fitter and stronger. You can lose weight by dieting, but no diet can make you fitter or stronger, only training can do that. There’s no such thing as a miracle diet, but proper nutrition combined with training and the right mindset is as close to a real miracle as you’ll ever find. the worst thing about this post is that, even though you are intending it as a joke, some people reading will actually consider trying one or two of the damn diets – you know it. and many readers, like me, who now know better (or are learning, also like me) will hang their heads in horror as they recognise things that once upon a time would really have appealed to them. when will the madness stop? Hi Ruth. Well, the subject certainly is not a “joke.” The post was merely meant to be entertaining, on a Halloween week theme… There are some serious lessons to be learned, as the parting advice explains. I believe its important to say A) DONT do this and B) Do this instead, rather than sweep issues (dangerous diets, etc) under the carpet and pretend they don’t exist. Hopefully those who might make the mistake of attempting even the least extreme of the diets on this list are in the tiny minority, and for every one who might, a thousand others steer clear as a result of reading this and taking the advice at the end. Cheers, Tom. SORRY … my reply to your post was not quite what i intended it to be. i blame caffeine depletion and overly sensitive reactions. after i had my coffee i rethought it 🙂 I am glad you have taken so much time to educate people, and helping so many ‘unlearn’ a harmful fear of food. thanks for taking so much time and care with all of your research. I had a former boyfriend who decided after a hernia surgery that he should detox because someone told him he should cleanse his system after anesthesia. He went to some cleansing retreat in Thailand and although he had almost zero body fat, he did not eat for about a week or ten days and just drank some kind of detox tea. He did drink some coconut water but when I saw him a few weeks later, he looked like he had aged twenty years. His skin was sagging because there was no fat layer under the skin and he had become very ill. I could not believe how gullible he was but he also used to look at spiritual angel cards when he needed advice. Hard to understand how people keep going for magic pills and quick weight loss or detox as i have watched friends do that master cleanse and loose all of their muscle tone. They all seem to gain the weight right back too. Another one is the hot yoga fad where people think they are sweating out toxins by doing yoga for an hour and a half in 106 degree heat. Well nobody ever told them that the kidneys and liver are what filter out toxins and sweat is there to keep you cool. Most of them do not drink any water when they are doing the yoga so they actually are stressing their kidneys and possibly losing less toxins. They all think they are losing weight too but its just water and important electrolytes. Also many of the stretches they do in the Bikram classes cause damage to the joints by over-stretching ligaments needed for joint stability. The numbers of injuries and joint replacements are going up for yoga. I invented a system called YogAlign based on engaging strength and flexibility at the same time and doing poses centered around getting good posture not good poses and we do not heat the air. Just so you know.. If your kidney’s aren’t filtering, you do expel toxins through the skin by sweating. (that’s why people use sauanas). The primary function of sweating is thermoregulation not detoxification. Which toxins specifically do you propose are released in any clinically significant quantity by sweating alone? Getting back on topic to this article, my mention of detox was in context of the master “cleanse” , which is an awful way to try to lose weight. even worse than most typical fad diets since it lacks minimal protein needs. “cleansing” or “detoxing” to lose weight falls right into the scam category and the terms are completely meaningless unless you begin your discussion by naming the toxin, then explaining how we test to see if the toxin is present in our body, to confirm that it is a health problem and then finish making your case by providing evidence that a diet, supplement, (sauna), etc actually removes the toxin if it is present in the body. These all hit the “eewww!” factor. I would add that Hollywood favorite, the colon cleanse, to the mix. There is just something about enemas. . .
Oh yeah, colon cleanse is way up there on the “diets I love to hate” too. I recently also heard of the cotton ball diet which is pretty scary stupid. but alas, I had already hit 7 and chose seven, because well it fit the horror theme! Cheers! As someone who was on a feeding tube for a few years due to medical reasons, I’m absolutely saddened and disgusted that anyone would even consider taking that kind of extreme action. For me, it was for life-saving reasons but to do THAT when your life isn’t hanging in the balance, just to lose a bit of weight because you’re too lazy to do it the right way, well that just makes me damn angry! I’ve lost 18 lbs of fat in 21 weeks following your Body Fat Solution, and I’ve got BtF,FtM on preorder here in the UK! Can’t wait! What scares me the most is the reality of what you had to endure during the years you were on a feeding tube.My heart rejoices that you are alive. I pray that your health will continue to heal.Tom’s website and books are sacred blessings in the garden of health and fitness.My warmest thoughts and prayers are with you and those you love. Thanks for the post, Tom. I recently heard of models eating tissues and other objects such as cotton wool balls in order to trick themselves into feeling full. Joe. If you want to be really grossed-out, Google ‘tenia parasite’. I found a video of a woman having a 5 yard tapeworm pulled out of her a**s.
That was a very gross and entertaining post . I think the tape worm diet was definitely the most disgusting. I just wanted to say that I think that some people never learn. Partly because they aren’t really looking for the truth and they wont find the correct methods because they Don’t Want Help or just want a quick fix . You can’t help someone who doesn’t want to be helped, right ? But If someone was dead serious about wanting to look better and lose fat, then they would be doing other things like researching weight loss and fitness, eating right and exercising and just simply making a genuine effort . Drinking Lemon drinks ? , Eating Worm Eggs ? Really People, What is wrong with you ? Healing Prayers from my heart . It’s realy scary. 500 calories per day was what the people put in the nazi concentration camps were given, and those were suppose to die. I can’t understand how somebody would willingly submit to that.